Vestibular rehabilitation therapy (VRT) is a specialized form of therapy intended to alleviate both the primary and secondary problems caused by vestibular disorders. It is an exercise-based program primarily designed to reduce vertigo and dizziness, gaze instability, and/or imbalance and falls. 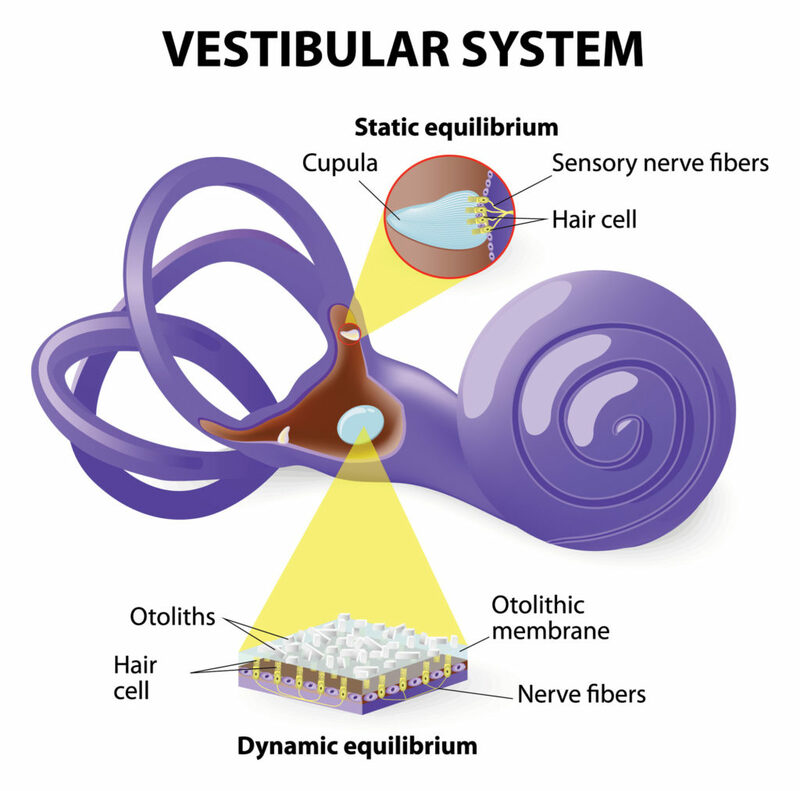 For most people with a vestibular disorder the deficit is permanent because the amount of restoration of vestibular function is very small. However, after vestibular system damage, people can feel better and function can return through compensation. This occurs because the brain learns to use other senses (vision and somatosensory, i.e. body sense) to substitute for the deficient vestibular system. The health of particular parts of the nervous system (brainstem and cerebellum, visual, and somatosensory sensations) is important in determining the extent of recovery that can be gained through compensation. Causes of Vertigois often caused by an inner ear problem. Vestibular rehabilitation has been shown to be effective in reducing dizzy symptoms with movement, improving balance, walking more steadily, reducing the risk of falls and improving confidence and endurance. It can help you get back to normal everyday activities like maintaining balance in the shower, walking, sport, or housework. It can also help to reduce fatigue and increase independence. The specialized therapist will typically try to isolate the specific deficit in the balance system at the time of the initial evaluation. Then a specific program will be developed in an effort to strengthen the weakened portion of the balance system or to allow the other portions of the balance system to compensate for its own weaknesses. This program typically takes 6 weeks with weekly visit with the therapist. surgery to decompress the endolymphatic sac or cutting the vestibular nerve, if nothing else works. For many, compensation occurs naturally over time, but for people whose symptoms do not reduce and who continue to have difficulty returning to daily activities, VRT can help with recovery by promoting compensation. The goal of VRT is to use a problem-oriented approach to promote compensation. This is achieved by customizing exercises to address each person’s specific problem(s). Therefore, before an exercise program can be designed, a comprehensive clinical examination is needed to identify problems related to the vestibular disorder. Depending on the vestibular-related problem(s) identified, three principal methods of exercise can be prescribed: 1) Habituation, 2) Gaze Stabilization, and/or 3) Balance Training.4) Habituation exercises are used to treat symptoms of dizziness that are produced because of self-motion3 and/or produced because of visual stimuli5,6. Habituation exercise is indicated for patients who report increased dizziness when they move around, especially when they make quick head movements, or when they change positions like when they bend over or look up to reach above their heads. Also, habituation exercise is appropriate for patients who report increased dizziness in visually stimulating environments, like shopping malls and grocery stores, when watching action movies or T.V., and/or when walking over patterned surfaces or shiny floors. Physiotherapy treatment is often covered under extended health benefits or disability programs and a physician referral is not necessary.